If Facebook is interested in something, you know it has to be big. 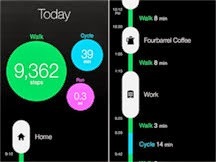 Doing a little research for this month, May, which is National Physical Fitness and Sports Month, I learned that Facebook has just purchased the app Moves, which tracks your movements for the day and gives you a report on your iphone. A little more involved than a pedometer which just counts steps, Moves knows (magically) when you are at work or when you have stopped at other places during the day. A little scary actually, but it could be a good way to focus on fitness at the same time. The app is free at the Apple App Store or Google Play on your iphone. To learn more about the sale of the app to Facebook, visit here.